be happy to share with each other what you all got up to. when he'd had time away with kids his own age. which she loves like when he's at regular school. The trouble with the school Summer holidays is most of your extra-curricular evening hobbies break up for the Summer too just like school. I know all of Lottie's toddler play and stay groups do. With Aaron though, we're very lucky in that our Football Club training and our BMX Club classes carry on throughout. But it can be a long six weeks with no school and no formal structured activities. We ourselves tried Bristol's Premier Camps in February and Aaron loved it - he made great friends and took part in gymnastics, football, archery, fencing and Nerf Gun wars over two days even coming away with a certificate. When he was in nursery when I went back to work just before he turned one, childcare was circa 50GBP a day, so I was pleasantly surprised to find Premier Education holiday camp from only 15.95 GBP a day (cheaper or dearer depending on the amount of notice given and whether booked on or offline. Book online before you attend, to guarantee a place and the cheapest price. There is a mobile phone contact for each Premier course and the phone is answered by a very personable and informed team member who will give you the exact advice you require. If you do a course local to home you may well find your child knows a few people there. Premier Camps!Everyone is invited to join the fun. It’s a fantastic, healthy, way for kids to get out of the house. Kids love being active and of course it’s cool being with friends. The usual verdict is "it was brilliant!" 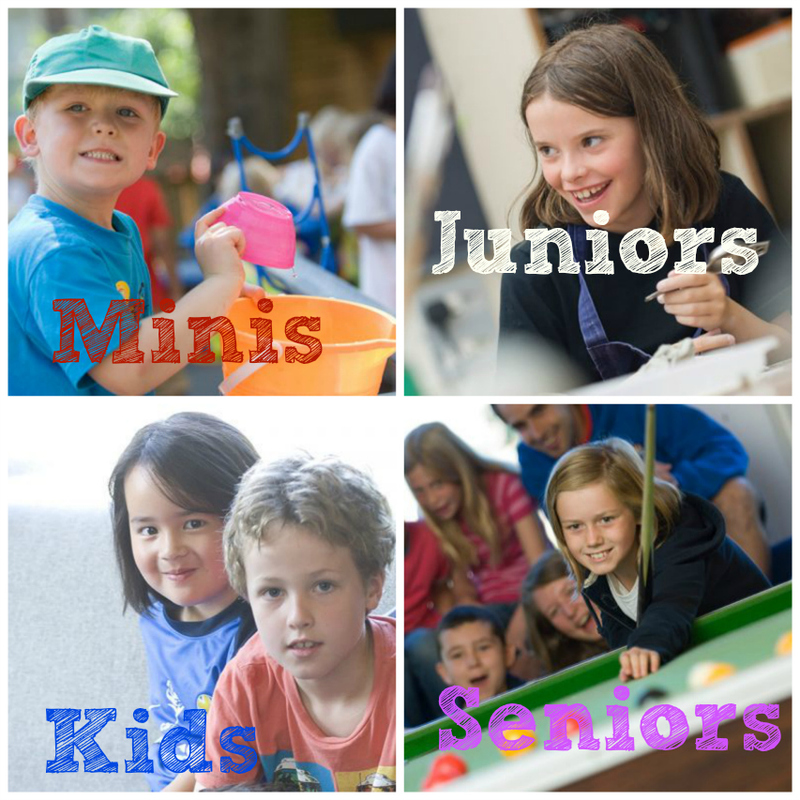 This summer, Clifton College in Bristol are hosting their popular kids’ clubs, with a group suitable for all ages between 3-13 years of age. Each club includes a wide variety of activities all with the aim that your children enjoy themselves and learn different skills on the way. focuses on personal development and interaction with others. focuses on encouraging children to pursue their interests and develop their skills through their own choice of activity. promotes self-expression, confidence building, offering complete flexibility and choice of involvement. Of course, all three groups offer FUN, with activities such as arts and crafts, outdoor play and even afternoon swim sessions (Kids’ Club and Junior’s Club). - £44 for a full day. 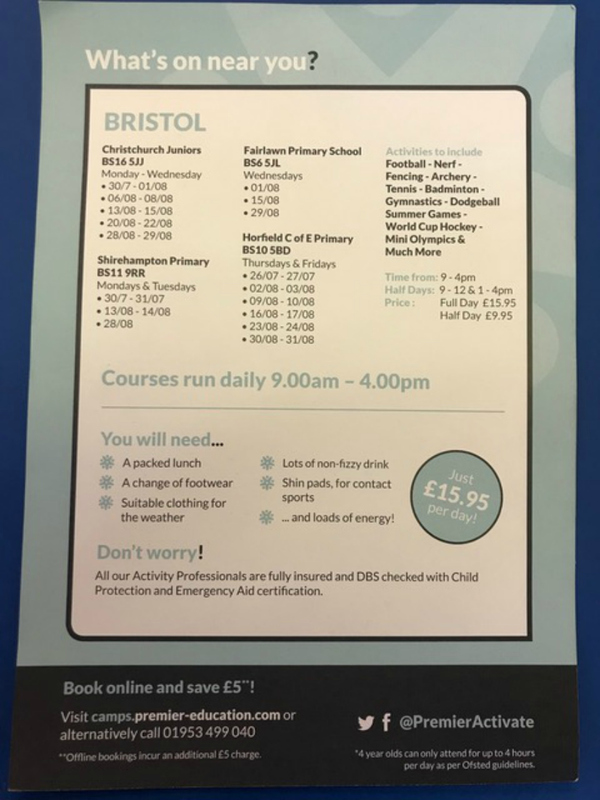 Minis Holiday Club is for 3–4 year old children plus 2 year olds who attend our nursery during term time and is based in Clifton College Nursery. This provides a stimulating and creative environment for young children during the holidays. Qualified and experienced staff will support children to engage in age-appropriate activities with particular attention paid to personal development, interaction with others and, most importantly, fun! Minis must bring a packed lunch each day. *Above is an example of a typical day and should be treated only as a guide. Variances regularly occur as staff adopt a flexible approach to meet children’s needs.